I showed a single detached property in my first “Flip of the Week”. I mentioned in that post that lots sold in 2016 have already been put back on the market. "Properties [single detached] bought in 2015 are now coming back onto the market and I expect that to gather speed. Lots bought last year are already being listed and sold." I believe I shouldn’t let this hang, but offer examples to back it up. Well, I am going to offer three examples and these 3 lots turn out to be in the same town; in the same subdivision; and, within spitting distance of each other on the same street. The lots are located in Trail Bay Estates which is the first development on the right as you leave Sechelt Village heading north on Highway 101. I’ve previously gone into great detail about this development and others at the VancouverPeak.com forum site. I will just say here it has become clear that a substantial number of the lots at TBE were bought as speculative investments as proved by the fact that most continue to sit empty and many have gone back on the market without owners ever breaking ground. To the best of my ability, I have determined that as of January 1, 2017 only 22 homes have been built in this 65-lot subdivision that began pre-sales in or around 2007. 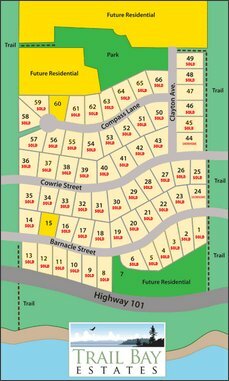 The Trail Bay Estates website went live in late spring 2008 and by August only 24 lots remained available for purchase. It would take another 9 years for the last of these lots to be sold - Lot 15, on April 19, 2017! Of the 41 lots sold before August 2008, only 12 buyers built homes (Lots: 6, 14, 29, 31, 33, 34, 35, 42, 50, 53, 57, 58) leaving 29 empty. The remaining 10 homes (of the 22) were built on Lots: 13, 24(showhome), 44(showhome), 45, 46, 47, 48, 49, 61, 62) leaving a further 14 lots empty. I an unable to say if anyone has begun to build since January 1, 2017. If anyone knows, please comment. Now, here are those three lots and their transaction histories. The sale prices have been blacked out; however, that information is easily accessible - you just have to think about where to check and then be creative to get in there (hint: your goal is the map). "From the developer's point of view, initially selling most of the lots seems to be a short term win. In the longer term though, the reputation of the developer begins to get tarnished when the property does not become an active neighbourhood and becomes an eyesore. From the resident's point of view, success looks like a pleasant, safe, interesting and prosperous neighbourhood, with the prospect of retaining or increasing property value in the future. So, from either perspective, Trail Bay Estates presents "an opportunity for significant improvement". And this is what a majority of the current residents have concluded." Well, guessing by these three lots, ddhawk, it likely won’t be at Trail Bay Estates anytime soon.